Life live at a slow pace in Medak — a countryside town that abounds in forts, cathedrals, wildlife sanctuary, and more. If a quick retreat is all you need this weekend, then hit the road and get (lost) here. If a day (or luckily, a weekend) is all you have, you should make plans to explore Medak. Popular for Medak Cathedral that is nearly 100 years old and one of the largest churches in India, people go here to check out the Gothic Revival style architecture of the cathedral. Plus, its stained glass windows recount the scenes from the life of Christ, which were installed at different periods. On our visit to Medak, we were in awe when we spotted the bell tower of the cathedral from a distance. Yup, the construction is just that beautiful. For the adrenaline junkie in you, there is a 12th-century monument — Medak Fort — built by a Kakatiyan ruler, Pratapa Rudra. Full of dilapidated ruins, rocky gates, and a 17th-century canon, this fort has a well-paved path of over 500 steps that lead you to the top. From the top, the panoramic vista of the town is mindblowing, and we recommend you experience it. Night camping at a lake, anyone? Yes, sir! Located just 12 km away from Medak is Pocharam Wildlife Sanctuary — on the banks of Alair River, a tributary of Manjira. Hemmed with lush paddy field plantations, the drive to this sanctuary is full of green surprises. The wildlife sanctuary also has the Pocharam Lake in its limits and while it is amazing to witness the sunrise here, we recommend you to camp for a night here. With BBQ, bonfire, music, and stories to tell, this is perfect for a tiny getaway. And not to forget, the Nizam Bungalow — a 100-year-old bungalow — is now known as a haunted house. If you’re looking for cheap thrills, make a visit to this bungalow. It’s creepy, so don’t say we didn’t warn you already. 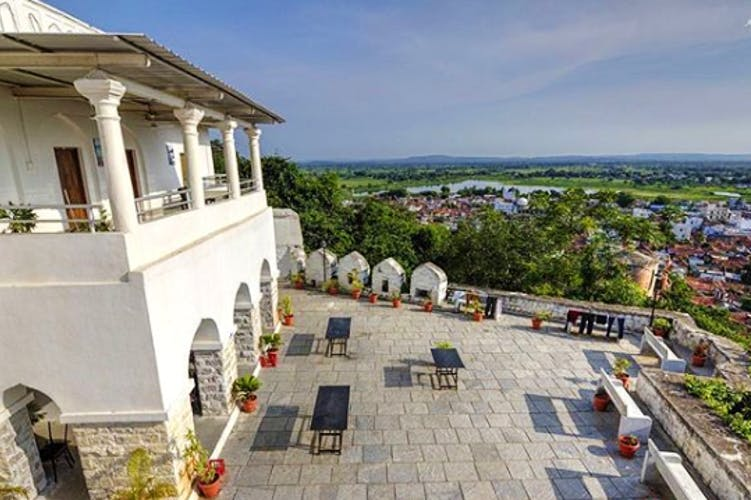 Telangana Tourism has converted a part of the Medak Fort into a heritage hotel which gives you a 360-degree view of the town. With INR 1,500 per night, this hotel is a hit with the tourists.